Seas T29CF002 E0040-06 Crescendo Tweeter - Excel Series is world famous as simply one of the best 29mm fabric dome tweeters ever made. Seas T29CF002 E0040-06 Crescendo Tweeter - Excel Series is world famous as the one of the best 29mm fabric dome tweeters ever made. High Sensitivity. Used in numeropus high-end loudspeaker systems. One of the stars of the justifiably famous Seas Excel Series, it is powered by a novel HEXADYM Neodymium magnet system based on 6 radially magnetized NdFeB magnet blocks. The Crescendo features efficient ventilation and damping of every potentially resonant cavity behind the dome, surround and voice coil. Moderate magnetic stray fields present no problems in AV installations. 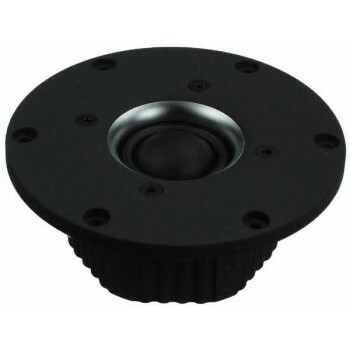 A generously underhung voice coil ( + and - 0.5mm ) ensures low distortion even with low crossover frequencies, and this is combined with an optimally shaped and coated fabric dome diaphragm manufactured from SONOMEX for excellent performance and consistency. Flexible lead-out wires prevent lead breakage due to the large excursions encountered when low crossover frequencies are used and give excellent low-distortion characteristics. A 6.0 mm injection moulded zinc 110mm OD front plate with chrome-plated brass central insert ensures outstanding linear frequency response, and a stiff and stable connection to the cabinet. A substantial zinc injection-moulded rear chamber eliminates unwanted chamber all resonances and conducts heat away from the magnet system.